Manny’s philosophy towards racing is one of pure personal enjoyment and satisfaction. While he likes to go fast and win races when he can, the idea is to have fun. In his own words, “One weekend of racing is like performing brain lobotomy”. Manny is one of the key drivers under the Rossini Racing tent. He and his fellow drivers are all good friends that enjoy spending the weekend together and love to challenge themselves to be the best without compromise. 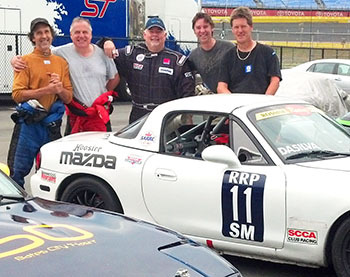 The whole group is relatively new to the racing circuit, and are into their fourth year of racing Spec Miata. 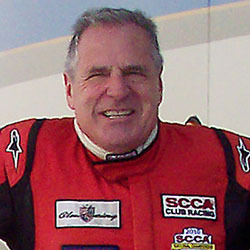 Their first race was the 2008 12 hours Enduro at Summit Point, and Manny and his team have raced in many Enduros since then. Manny and Mike Rossini collaborate closely, working on developing the cars and the engines, and perfecting their setup. Manny and his friends now race at many tracks, around the country and their results continue to improve, and while this provides satisfaction, for Manny it doesn’t come close to enjoying a great meal and a good bottle of wine trackside swapping stories and enjoying each others company.